Good news is flooding in as Joost Goverts at Northrop & Johnson in Palma tells me he sold the 40m sailing sloop Mirabella I in May. Built by Thailand's Concorde Yachts in 1991 as the first of a series of charter yachts, Mirabella I was rebuilt in 2005. An interior designed by Peter Sjim accommodates up to 14 guests in two doubles and four twins plus two Pullman berths. 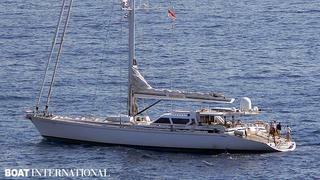 A single 550hp Lugger engine gives her a range of 3,500 nautical miles under power. Mirabella I was asking €1 million.